The events surrounding the 1913 murder of the young Atlanta factory worker Mary Phagan and the subsequent lynching of Leo Frank, the transplanted northern Jew who was her employer and accused killer, were so wide ranging and tumultuous that they prompted both the founding of B’nai B’rith’s Anti-Defamation League and the revival of the Ku Klux Klan. 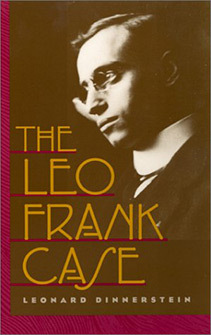 The Leo Frank Case was the first comprehensive account of not only Phagan’s murder and Frank’s trial and lynching, but also the sensational newspaper coverage, popular hysteria, and legal demagoguery that surrounded these events. Leonard Dinnerstein is New York born and bred. He attended Public schools in the Bronx, went to the City College of New York for his undergraduate degree, his MA (1960), and PhD (1966). Dinnerstein is an emeritus professor of American history at the University of Arizona, where he directed the Judaic Studies Program. His books include America and the Survivors of the Holocaust and Anti-Semitism in America.